New York, SANA- The situation in Idleb isn’t stable as Jabhat al-Nusra terrorist organization continues its provocations against the Syrian Arab Army and it targets civilians, so we can’t keep silent towards this issues, Russia’s Permanent Representative to the UN Vassily Nebenzia said. 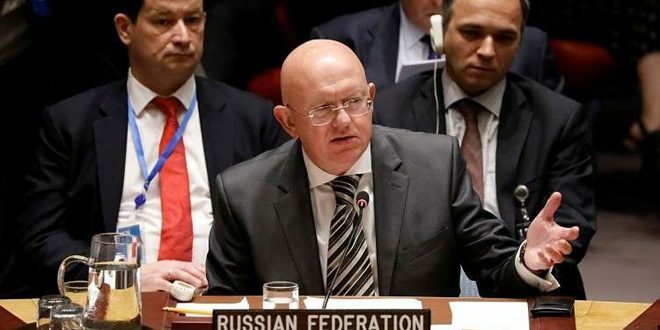 During a session of the Security Council on Tuesday on the situation in Syria, Nebenzia expressed his country’s concern over the situation in al-Rukban Camp where the US occupation forces are deployed and they hold civilians, affirming the necessity of not hindering the exit of those who are willing to leave the camp. The Russian diplomat indicated that a public opinion poll held by UN experts at al-Rukban Camp in al-Tanf area showed that most civilians in it are willing to leave the camp and to return to the areas which are under the authority of the Syrian state. He added that hundreds of thousands of the displaced Syrians have returned to their homeland after the Syrian Government had prepared the suitable conditions for their return. Nebenzia reiterated that Brussels Conference or any conference that discusses the situation in Syria will be incomplete without inviting the Syrian Government to take part in it. For his part, China’s Permanent Representative to the UN reaffirmed the importance of finding a political solution to the crisis in Syria led by the Syrians without any foreign interference according to the resolution No. 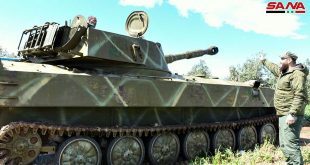 2254. The Chinese Representative called upon the international community to exert more efforts to reach a solution to the crisis in Syria. He asserted that no party can define the future of Syria except the Syrian people and the international community should respect that.